Scene fades in from black to show Daniel and Elinor side by side in front of the refreshments table. 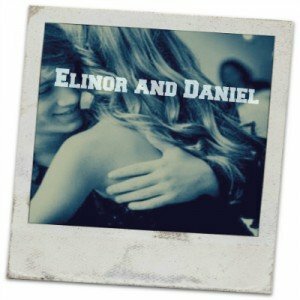 Daniel takes one cup for him to drink and hands one plastic cup to Elinor before they both turn around, leaning on the table as they chat and sip and observe the other teens around them. If I were to say you were funny, what would you say? Well, first I would ask if that were a good thing or a bad thing. Then I would, depending on your answer of course, make a jokey, lighthearted comment regarding your answer. For example, if you said good, it would be, “Well, I think you’re funny too.” If you said bad, the option I think you would be more tempted to select, I would say, “Well, not all clowns can be as funny as Rudolph––oh, wait, he was a reindeer.” And then I may get to hear your laugh again. Elinor turns around to get more punch. Not that I mind your company. Actually, I enjoy it a great deal, but why did you come over here? Aside from being thirsty you mean? Considering I neglected the common courtesy of asking you to the dance, I was hoping to make up for it by asking you to dance? I’m not going to force you into anything, Daniel. You’re definitely not forcing me, Elle. I want to. I promise. I like you. And you like dancing. Therefore, by the transitive property, I’m going like dancing…with you. So you, Daniel Two-Left-Feet-Ryker, are willingly going to accompany me onto the dance floor because you like me? Daniel puts his plastic cup back down onto the table. Elle, I’m not a dancer. No one will look at me in awe when I’m up there. Not like how they would gaze at you. It would probably be the exact opposite reaction. And I’m okay with that. Because I can use my words, I can tell you how much I like you and ask you to dance, even though it’ll probably look like the princess dancing away with the oversized frog, and enjoy myself in the process…But only if you accept. Daniel looks hopefully at Elinor and Elinor laughs slightly and grabs his hand. Then I can only agree. I like you too Daniel. A lot. And if I’m going to dance tonight, then I might as well make it memorable and dance with you. Daniel tugs on Elinor’s hand. Oh, it’ll be memorable, alright. Come on. Daniel drags Elinor onto the dance floor and the lights go dark. Sana Hameed is a 14 year old American writer who enjoys trying new things. This scene is the first time she has attempted to write a script and she can’t wait to write more. Sana fell in love with writing creative fiction in first grade and has over time developed an interest in other areas such as poetry and nonfiction. She enjoys writing short works competitively to hone her abilities as well as working on her own fantasy novel. In her free time, Sana loves volunteering regularly, doing Tae Kwon Do, and spending time with her friends and family. This is really good! I thoroughly enjoyed it. In fact, it reminded me of a book I’ve read: “The Fault In Our Stars” by John Green. The relationship Elinor and Daniel have in this scene is similar to that of the two leading characters in “The Fault In Our Stars”. This scene melted my heart and made me smile. Keep writing, Sana!